A live-work space designed with Rhode Island-created furnishings and décor receives two awards at the Rhode Island Home Show – “People’s Choice” and “Lifestyle Achievement.” Ainsley Bonham, designer at Judd Brown Designs and RISD|CE Interior Design graduate, and Elise Fargnoli of Paradigm Media Consultants and RISD|CE faculty member, lead the design team in the interior design challenge featuring seven of RI’s top designers. 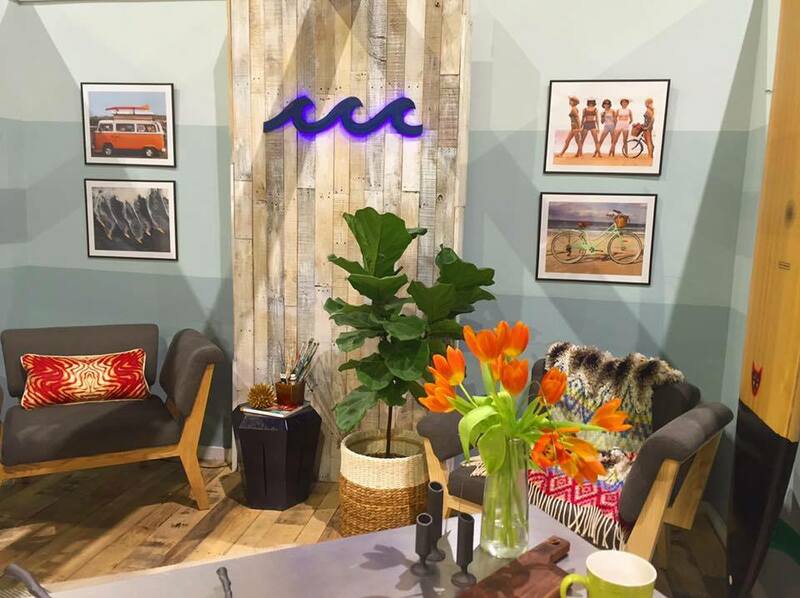 Each team was given an empty room to represent a coastal living theme within the space. Once the design was completed, the People’s Choice Award was chosen according to votes of about 22,000 visitors passing through the Rhode Island Home Show held at the Rhode Island Convention Center from March 31-April 3. Newstamp Lighting Corp was an additional contributor assisting the team to capture the Ocean State concept. The collaboration consisted of creating the LED blue wave light featured in the award-winning coastal living room. This wavy final touch is brilliant and bright! "I had the pleasure of working with Newstamp Lighting on several hospitality projects in Massachusetts," says the designer, a recent graduate of the RISD Interior Design Certificate Program and current designer at Judd Brown Designs in Rhode Island. "This past March I participated in the Rhode Island Home Show Designer Challenge and was looking for a contemporary, coastal themed light fixture for our room. 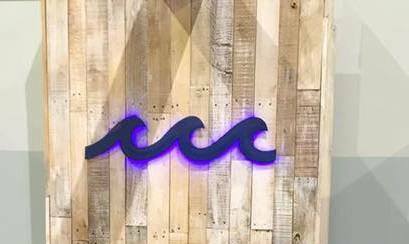 After deciding on the wave design, I reached out to Newstamp Lighting knowing that their facility had the capabilities to take the concept and make it come to life. I was so pleased with the finished result and greatly enjoyed the collaborative process. We received multiple inquires about the fixture and are excited to further developing the wave light for future projects." Newstamp Lighting offers custom lighting and reproduction to match nearly any specification of style, design and scale; including materials such as aluminum, copper, brass, steel, glass, crystal, bronze and more. They complete projects in both established interiors and recognized exteriors. The quality and reputation of Newstamp Lighting's work expands throughout the Greater Boston Area and beyond since the company's inception in 1939. See the full story on the Rhode Island School of Design Continuing Education website.